Handling of banana leaves for cooking is quite a feat if you don't know how to properly prep them first. They easily break, and you need to work around the imperfections and narrow widths. So you ask, why even use banana leaves? For one, they leave a distinct 'native and homey' taste to any dish or native delicacy, feels like you're eating under a tree by the rice fields... like in the old movies or something like that. Roasted chicken gives a semblance in taste to Andok's Chicken when wrapped in banana leaves. 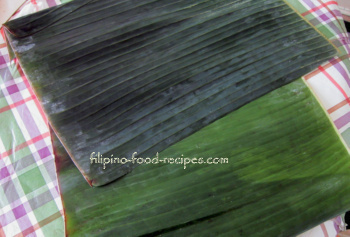 Bibingka doesn't taste authentic if not cooked with a banana leaf liner. Most Suman are cooked wrapped in dahon ng saging. So even if it entails extra work, it's gonna be all worth it in the end. You need heat, direct or indirect, to prep the banana leaves. Direct heat means holding the leaf directly on top of a burner, moving it slowly to heat the whole leaf - until glossy. The gloss means the leaf is now pliable and easy to handle. Indirect heat - though not traditional - these are ways I have tried and tested, and I can say they work for me. Oven baking - if your oven is on, you could put the leaves in briefly - only until they turn bright green and glossy. However, if you leave them on too long, they could cook, lose its oil and become brittle. Microwave - Yes, I've done this a lot of times - I set it to one to two minutes, depending on the how many plies of leaves I need to heat. Try using 30 seconds at a time. Hot water bath - briefly pass through hot water(not lukewarm) until you see change in color -- but do not soak as it could dry out the leaves. Remember, whichever process you use to prep your banana leaves for cooking, your mark or indication that they're ready for use are the glossy appearance and the pliable texture. Where to buy banana leaves when you're not living in the tropics? Try the frozen section of an Asian supermarket. Thais, Vietnamese, Malays and those from the tropical places like the Caribbean and even Hawaii also use them so they are not really hard to find. Need to cut them in rounds or squares? Make a cardboard template of your desired size. This way, you could maximize the usable area of the leaves. Hey, it's not about being cheap -- it's about being wise enough not to waste the banana leaves for cooking you painstakingly heated and prepared. Lastly, remember to rinse them clean before using.